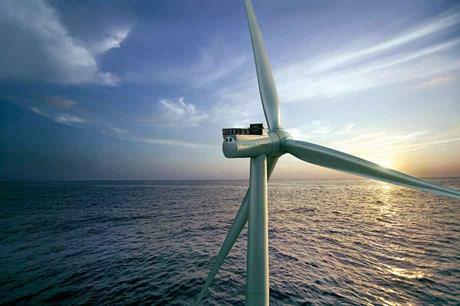 NETHERLANDS: A 167-metre rotor and power-mode option to hit 9MW are the headline features of the latest upgrade to Siemens Gamesa's direct-drive offshore platform, revealed on 28 November at the WindEurope conference in Amsterdam. The major visual differences between the SG 8.0-167 DD and the current D6-D8 series are the longer blades — up from 75 metres to 81.5 metres for an MHI Vestas-beating rotor diameter of 167 metres — and the backward repositioning of the helicopter-hoisting platform. This was required to minimise personnel collision risk with the longer blades during hoisting operations. Another notable change is a nacelle cooler upgrade that allows easier upkeep. "The SG 8.0-167 DD is an evolution and incremental optimisation of the 6MW and 7MW platforms," said turbine-platform manager Henrik Olesen. "The nacelle and generator main structure and dimensions have remained unchanged to a large degree." The SWT-6.0-154, launched in 2011, has now been discontinued, with SGRE concentrating series production on the upgraded 7MW model, renamed as the SG 7.0-154 DD since Siemens' merger with Gamesa, at the new Cuxhaven plant in Germany (see box). An 8MW prototype with the 154-metre rotor diameter is being tested, but will not be actively offered as the focus shifts to the new 8-9MW turbine with the longer blades. A larger, fully enclosed space underneath the nacelle behind the tower was introduced for the 7MW turbine to accommodate a higher-rated MV transformer, and this proved big enough for the slightly larger 66kV transformer that will become a semi-standard fitting on the 8.0-167. 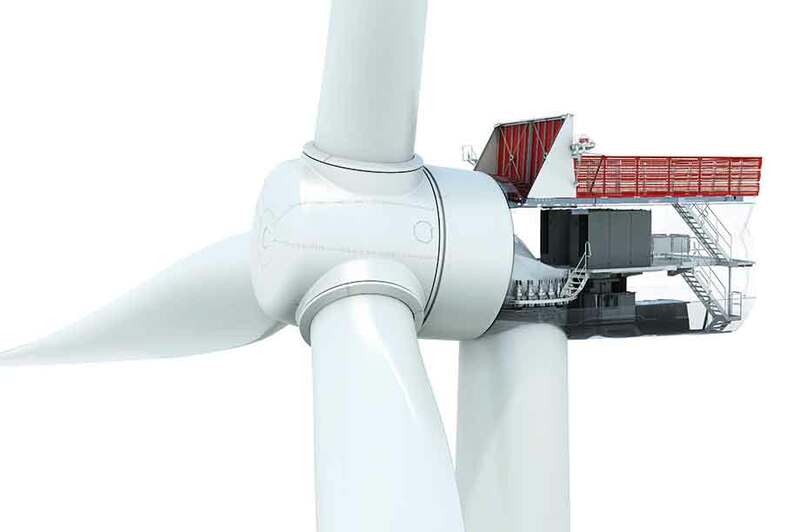 Another design change from the original 6MW turbine is the moving of the pitch-system hydraulic control unit from the nacelle into the hollow generator shaft. "A main benefit of incremental changes to an existing concept is that these are, in general, rather inexpensive set against the total value gained," said Olesen. "Other benefits include building track record experience faster, enhancing industrialisation of production, supply-chain developments, as well as achieving savings through efficient transport logistics." The power-mode option is again an important feature of the new model. It offers improved levelised cost of energy (LCOE) and annual energy production (AEP) under specific site conditions, such as stable, "constant" wind speeds combined with low turbulence and within given operating temperature limits. Maximum output will be enhanced by the turbine controller and is referred to as "flex", short for flexible. The maximum power mode rating could be as high as 9MW, but will ultimately be decided by the client, depending on optimal site configuration. Like the 8.0-154 prototype, the 8.0-167 is fitted with load based individual pitch control (IPC), aimed at minimising rotor and turbine loads. This advanced control strategy continues to make inroads in both the onshore and offshore sectors. With load-based IPC, individual rotor-blade loads are measured continuously from near the blade root during each rotor revolution, and pitch angles are adjusted accordingly. "The main design driver was curbing loads, and the second major development goal was keeping main components unchanged whenever feasible," said Olesen. "Deploying load-based IPC enabled us to keep the rotor bearing size unchanged. Another major effort focused on the development of a rotor hub that would enable optimised load transfer with the blades." "In each generator upgrade, from the 6.0-154 to the 8.0-154, we introduced stronger magnets, uprated converters and MV-transformers for matching intermediate steps to higher ratings. But we've been able to use the 8.0-154's generator for the 8.0-167 as it operates within the same rotational speed range. Our engineers incorporated some cooling enhancements as well," he added. The new blade design greatly benefited from accumulated in-house know-how gained from development of the B75 blade, which started in 2009. Like the B75, the 81.5-metre B82 unit does not contain carbon, but mass has only increased a little despite it being 6.5 metres longer. A consequence of the longer blades running at similar rotor speeds is an 8.5% increase in rated tip speed. Without adequate counter measures, this could cause greater leading-edge erosion degradation, leading to reduced aerodynamic performance, more downtime and higher operating costs, all impacting on LCOE. SGRE's response is a thin polyurethane layer integrated within the composite material as a leading-edge protective cap. "A main benefit of polyurethane set against tape or protective coatings is its superior long-term impact-wear resistance," said Olesen. "Also important is polyurethane's capability to absorb cumulative impacts caused by wave-swept water droplets, plus dust and other particles, preventing them from degrading the composite materials underneath." The introduction of the SG 8.0-167 DD comes amid a continued wind industry debate on optimal specific power ratings. Its 365W/m2 is close to the SG 7.0-154 DD's 376W/m2, but much below the recently launched MHI Vestas V-164-9.5MW's 450W/m2. German engineering consultancy Aerodyn claimed around 425W/m2 was optimal for high-wind offshore applications when launching its floating 15MW SCDnezzy2 twin-rotor concept this spring. According to Olesen, the 8.0-167 offers up to 20% higher AEP than the 7.0-154 at typical IEC Class I sites, due to its 17.6% increase in rotor-swept area. Capex and Opex are largely unaffected by the upgrade. The first step in the path to series production will be replacing the rotor on the 8.0-154 prototype at Osterild with the larger 167-metre rotor for certification testing. Parallel trials will be performed at SGRE's test facilities in Brande, Denmark. A collaboration with Fraunhofer IWES involves the testing of a full nacelle at the Dynamic Testing Laboratory in Germany, from April to December next year. The focus here will be on generator performance and grid compatibility, enabled by Fraunhofer IWES's comprehensive grid simulator and highly dynamic drive system. "The combined testing and validation efforts enable a faster time-to-market, and help to avoid unwelcome 'surprises' following market launch," said Olesen. "The market focus is on large-scale, far-from-shore projects, and it will be commercially available from 2020." SGRE expects to have around 500, mainly SWT-6.0-154, turbines in operation by the end of this year, with around 550 more of the 7MW version running by late 2019. Production of the 7MW turbine is being ramped up at the new nacelle facility in Cuxhaven, Germany, which is now close to being fully operational. The plant is functionally organised into three main production lines — for generator manufacture, hub and nacelle "back-end" assembly, and for merging these assemblies into the nacelle. At the core of SGRE's direct-drive platforms, onshore and offshore, is a novel in-house developed outer-rotor PMG technology, including a stator composed of multiple pre-manufactured segments. With the outer-rotor principle, the generator-rotor rotates around the inner stator, and this rotating ring directly behind the rotor serves as a distinct visual feature of all SGRE direct-drive turbines. The overall concept is similar for generators, with variations in diameter and length, the number of segments, and the quantity of magnets. "The ring has a modest wall thickness, and together with the inward facing magnets for a given outer diameter creates a maximised airgap diameter (between rotor and stator)" said Olesen. "A main benefit of this layout, compared to a classic inner-rotor PMG is 15-20% higher generator torque and power output for a given outer diameter, assuming similar generator revolutions. Another is a generator mass saving of up to 20%. And the lower operating temperature of the magnets allows a lower percentage of the costly dysprosium rare earth." SGRE's advanced generator production is characterised by a high level of automation and manufacturing precision. Much attention is given to preventing materials fatigue damage in copper bar linkages between individual segments. Especially hi-tech is the magnets assembly with pick-and-placement robots for individual generator stations. "The initial 3MW D3 turbine has been very important, and a great learning source for all later product developments," said Olesen. "It was the evolutionary blueprint for all successor models, including the offshore dedicated turbines and upgrades. It allowed us to build necessary supply chain and track-record experiences much faster then competitors who had different concepts for onshore and offshore."